With Elvis Dumervil gone, the Denver Broncos are determining who will replace him. In no rush to sign a veteran free agent, the Broncos are ready to hand more responsibility to fifth-year defensive end Robert Ayers. On Monday, John Elway, Denver's executive vice president of football operations went on The Dave Logan Show on the team's partner radio station, 850 KOA. 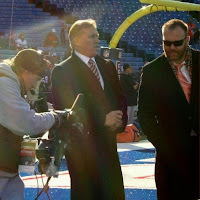 Among the topics was who would replace Dumervil—Ayers was Elway's response. "As I've said, those guys out there (Dwight Freeney and John Abraham) are options, but the bottom line is we also feel very comfortable with Robert Ayers. He's going to be at the right (defensive) end—as of right now he's our starter at right end," Elway told Logan (via Gray Caldwell of DenverBroncos.com). Elway says as of right now Robert Ayers is the starter at RDE. Ayers was drafted by the Broncos 18th overall in 2009 NFL draft by former head coach Josh McDaniels. Since then, Ayers' production has been minimal. Originally projected as a rush outside linebacker, Ayers has been a defensive end in Denver's 4-3 defense since John Fox took over in 2011. Ayers did not make any starts in Jack Del Rio's defense last fall, but recorded two sacks as a rotational player. Ayers only has 6.5 sacks since entering the league, but with an increased role, the team is hoping for increased production. "We feel like we can go to bat with the guys that we've got if that's where it ends up, or if other things shake out we'll go that direction," continued Elway. Freeney remains an option, but if he does land in Denver, it will probably happen closer to training camp—or at least after the draft. In the draft, expect the Broncos to give all of the defensive end prospects long, hard looks. The first round of the 2013 NFL draft will take place on Thursday, April 25. Denver is slotted to select 28th overall in the first round.